I was born and raised on a dairy farm in West Central Illinois, where I was very active in 4-H and high school sports during those days. After high school graduation I attended The Ohio State University and earned my bachelors degree in animal science. I was then accepted and attended University of Illinois/ College of Veterinary Medicine where I earned my doctorate of Veterinary Medicine degree. I knew I wanted to be a veterinarian since I was a young boy of seven, now I had accomplished my dream. 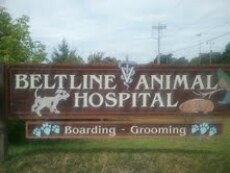 I worked in two mixed animal practices in Illinois before moving to Madison in 1982 to pursue small animal practice and that is when I began management of the Beltline Animal Hospital. In 1987 with the growth of the practice we built and moved the into the new facility. I enjoy all aspects of small animal medicine and surgery, but especially enjoy performing surgery. In my spare time I enjoy spending time with my wonderful wife, Peg whom I have spent the last 35 years enjoying life with. Of course enjoying high school sports when I was younger has followed me to my adult life and I enjoy college and pro football and college basketball and I am lucky enough to have a wife who enjoys watching it too! I have three energetic cats that make our clinic whole; We have Gozer, Spark Plug and Chassie who you may see on any given day at the clinic and they always look forward to a little lap time from anyone whom is willing to share. I have worked at the hospital since high school, started out doing kennel work, expanding knowledge to groomer for a bit and receptionist/ vet assistant for the past 37 years. I am very capable and willing to help out in any area needed. I enjoy my job very much and love to visit our clientele and their pets on each visit. There is never a dull day at the Beltline Animal hopsital, whether it be our clientele and their pets or our own two clinic cats that ad fun to our day. Outside of work I have a wonderful husband, John of 30 years, we enjoy flea markets, antiquing, and spending time outdoors. We have two sons, Tyler and Josh who we have had so much fun watching grow into wonderful young men, of course spending time with them is always an exciting adventure. Of course our home would not be complete without our devoted four legged friend, Swiffer, our 15 year old dachshund mix.